We offer professional gutter cleaning in Kirkcaldy for residential and commercial customers, and provide gutter repair to commercial and domestic customers. Many customers book this yearly with us, others do so for reassurance as they move into a new home, and we carry these services out fife wide. See our gutter cleaning page for more information. 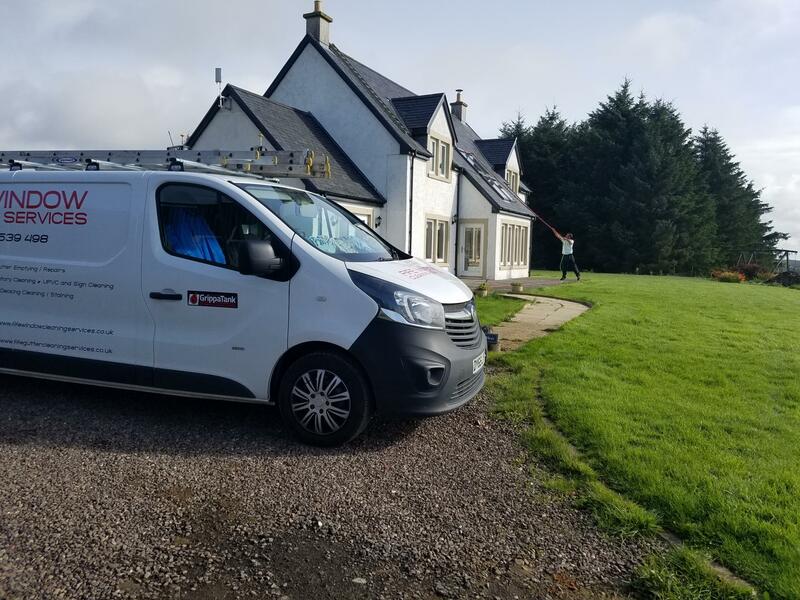 We have the tools to clean gutters up to 30 foot high and also use extension tools so we are able to access hard to reach gutter cleaning in the Kirkcaldy area. The process of us providing a quote is simple. You can either call, text, email or use the submission box to contact us. We do not have long waiting times for gutter cleaning, instead always aiming to either have this done as a matter of urgency (if required) or within one week max. Gutters get blocked by many things including dirt, leaves, moss, fruit and twigs; this in turn creates a perfect growing environment for grass ad plant seeds dropped by nesting birds. We will empty all downpipes as standard, and offer you the option to have the down-pipe covered by a wide gutter mesh to prevent future blockages. We remove all soil and water from the gutters and also dispose of the waste; the removal of water is important; due to this offering an environment that would lead to more biological growth. The cost to replace gutters can be substantial, this can be prevented through yearly maintenance of your gutters in Kirkcaldy. Full gutters can weight several kilograms, and all that is holding these gutters up are brackets spaced out several feet apart. Poorly maintained gutters can also cause internal dampness as explained here www.davidkinsey.co.uk. Blocked downpipes can lead to water finding its way through screw fittings and full gutters can deteriorate wall conditions, where continuous splash backs on nearby walls find minute holes through and into the home. Should you have a gutter leak, we can rectify this. We can apply a two part bonding agent on cast iron gutters that will seal the gutter again. We also have various other supplies that can fix uPVC gutters should this need done. We are exterior cleaning specialists equipped to clean house and building facias, soffits and cladding, gutters, solar panels and conservatories. Our pressure washing for outdoor areas such as driveways, patios, mono block and decking is the best value for money and professional pressure cleaning service in Fife. Call us now on 07856 539 498 or email using the Contact Us page for a free no obligation quote or further information. Minor Gutter repairs can be offered such as sealing, metal bonding on metal gutters and such like. For full new gutters in Fife I can offer good recommendation of a local roofer. Call us today for a quote on 07856 539498 or email us by filling in our online contact form today.